With the growing amount of available geographical data, it is useful to be able to visualize one's data on top of a map. 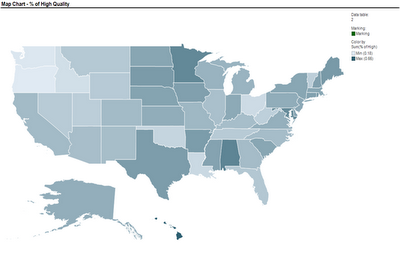 Visualizing numeric and/or categorical information on top of a map is called a map chart. Two student teams in my Fall data mining class explored and displayed their data on map charts: one team compared economic, political, and well-being measures across different countries in the world. By linking a world map to their data, they could use color (hue and shading) to compare countries and geographical areas on those measures. Here's an example of two maps that they used. 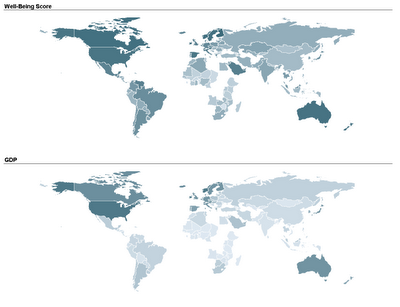 The top map uses shading to denote the average "well-being" score of a country (according to a 2004 Gallup poll), and the bottom map uses shading to denote the country's GDP. In both maps darker means higher. The tricky part is obtaining shapefiles. One good source with free files is Blue Marble Geographics (thanks to Dan Curtis for this tip!). For US state and county data, shapefiles can be obtained from the US Census Bureau website (thanks to Ben Meadema for this one!) I'm still in search for more sources (for Europe and Asia, for instance). I thank Smith MBA students Dan Curtis, Erica Eisenhart, John Geraghty and Ben Meadema for their contributions to this post. Hi Dr. Shmueli, we also have the world map with discrete colors, rather than the gradient. Would you like that one as well? If you think that using different hues ("discrete colors") highlights other information then sure. If you can't post it yourself, send it to me and I will post it on your behalf. Wells - this is pretty cool! One suggestion is to replace the multi-color coding with a gradual scale. This is because you are conveying increasing values of a growing percentage. By the way, what technology did you use to create the slideshow? I worked with the gradual scale at first, but it was hard to tell the difference between the states (this was before I added the values below, I probably should have thought about going back after I added the values). For the slideshows, I exported each page from Spotfire into Powerpoint, then right clicked each image and saved them as pictures (.png files). I then uploaded them to my SmugMug account (photo publishing website) and posted a link to the slideshow. Wells - you can control the amount of contrast between the different color shades by assigning different values to different shades in the Properties>Color area in Spotfire. Thanks for the tip on posting the visualizations as a web-enabled slideshow! Select a country, and then select "Administrative Areas".